Saharan folk-blues unit Tinariwen are complementing their recent Emmaar album with a collection of acoustic recordings tracked during the same sessions in Joshua Tree, CA. Fittingly enough, the EP is titled Inside / Outside: Joshua Tree Acoustic Sessions, and it arrives October 7 through Anti-. A press release explains that the five-song set of "hypnotic acoustic songs" comprises late-night jams the band would undertake at night after putting work into Emmaar. Some of these sessions were captured inside the same house where the LP was being recorded, while other songs were performed outside in front of a campfire. You'll find a trailer for the project that shows the collective circling around the flames and microphones to deliver a tune, while you can sample the set's "Iljaych Tareq" over at Aquarium Drunkard. In addition to Emmaar and the upcoming EP, Tinariwen's back catalogue was recently revisited via Light in the Attic. Earlier this month, the label delivered new vinyl pressings of 2001's The Radio Tisdas Sessions and 2004's Amassakoul. 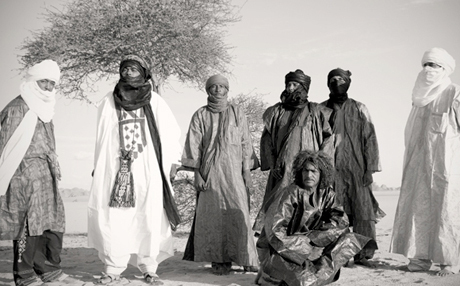 Tinariwen have a number of global appearances lined up to get them through the rest of the year. While none of these are in Canada, you can check out the hefty schedule over here.